It's the season to make a new Christmas stocking or two. 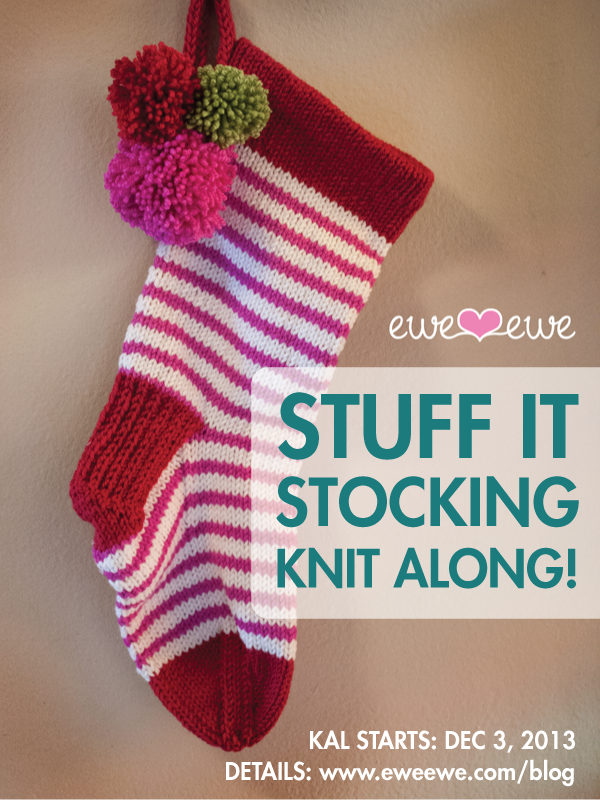 The Stuff It Stocking pattern by Ewe Ewe is a lot of fun and totally cute! Isn't it fun? With all of the color combinations in Wooly Worsted yarn you'll be sure to find a great set to fit your home. The stocking above is knit with Red Poppy, Vanilla and Berry colors and below is a funky combo with Pistachio for the top, bottom and heel and Vanilla and Black Licorice stripes. The stocking is fun to make if you know how to knit socks and even if you don't! We have all the steps laid out for you, seriously step-by-step! So now if you're ready to get started take a look at all these awesome stockings made by knitters across the country. You can check out these and a lot more versions of the Stuff It Stocking on its Ravelry page. Are you ready? Get the pattern here or on Ravelry; it's on sale through the holidays no coupon needed! Find a Ewe Ewe yarn store near you or see Wooly Worsted yarn on our website. It may seem crazy but it's time to start thinking about your Christmas knitting, and what better thing to prepare for the holidays than with a cute stocking ready for Santa to stuff. Meet the Stuff It Stocking! Our Christmas stocking knitting pattern is really just a big sock in disguise. You start at the top and work you way down to the heel and finish at the toe. If you're a seasoned knitter the pattern is fun and easy to follow plus there's some techniques you may not have tried before like the hem at the top. If you're a newer knitter, the Stuff It Stocking pattern is a great way to learn how to knit a sock and a bunch of other knitting skills. We even have a step-by-step knit along that you can follow! Check it out here. You'll have fun making this pattern and you'll want to knit it for everyone in your family! With all the great colors of Wooly Worsted yarn you'll be able to make a combination to fit your favorite room's decor. Check out all the amazing color combos on Ravelry! The pattern only needs one ball of each of the three colors you choose (and maybe a little extra if you decide to add the cute pompoms!). Now's the time to get your Christmas knitting going! Stuff It Stocking downloadable PDF knitting pattern on sale this week 9/10 through 9/16. Santa is coming and you better knit your stocking so he can fill it! That's why we designed the Stuff It Stocking knitting pattern to be the cutest Christmas stocking on the mantle. Santa can't miss it! Knitted in Wooly Worsted yarn, you can choose the colors that fit your holiday style. Colors like red, green, pink, tan or teal can make your holiday decorating unique! The Ewe Ewe Stuff It Stocking knitting pattern is worked like a traditional sock and has a knitted hem creating a finished edge at the top of the stocking. Add the loop for hanging, pompons for flare and you're all set for Santa!